Since the turn of the millennium, the Internet has evolved from what was merely a new medium to a true mass medium-with a deeper and wider cultural reach, greater opportunities for distribution and collaboration, and more complex corporate and political realities. Mapping a loosely chronological series of formative arguments, developments, and happenings, Mass Effect provides an essential guide to understanding the dynamic and ongoing relationship between art and new technologies. 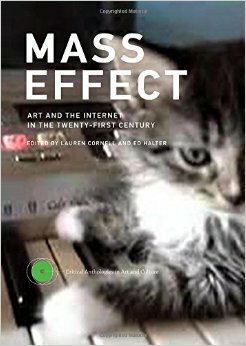 Mass Effect brings together nearly forty contributions, including newly commissioned essays and reprints, image portfolios, and transcribed discussion panels and lectures that offer insights and reflections from a wide range of artists, curators, art historians, and bloggers. Among the topics examined are the use of commercial platforms for art practice, what art means in an age of increasing surveillance, and questions surrounding such recent concepts as "postinternet." Other contributions analyze and document particular works by the artists of And/Or Gallery, Cory Arcangel, DIS, Cao Fei, the Radical Software Group, among others, including an essay by Michael Wang on Ryan Trecartin.